When oranges are in season you must make homemade orange curd. 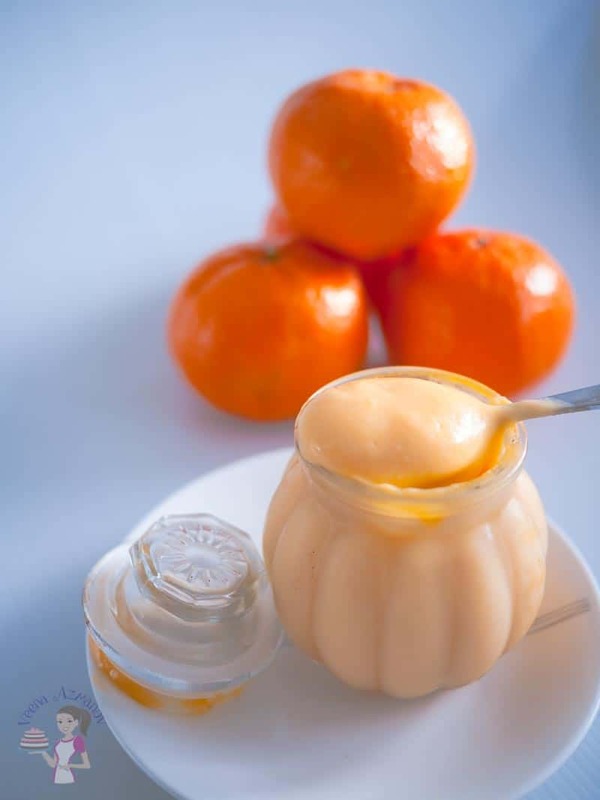 This simple, easy and effortless recipe for no-fail orange curd is the best you will ever taste. Sweet, tangy with a melt in the mouth luxurious texture. 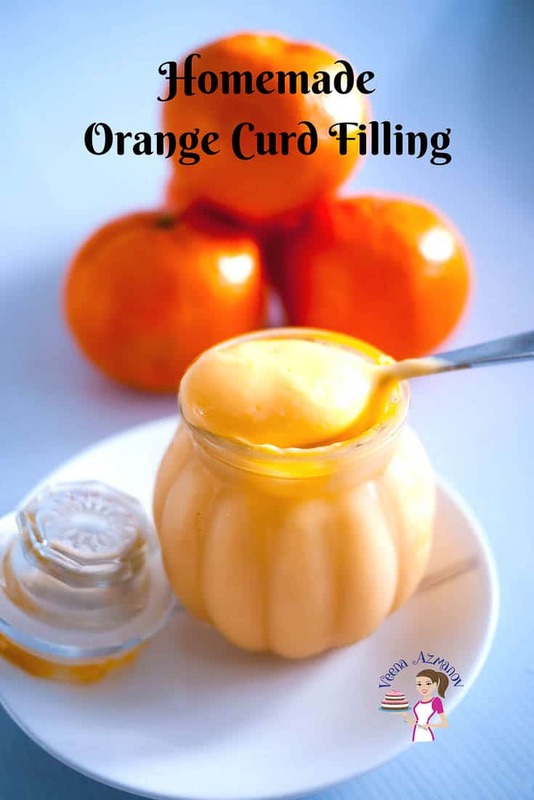 An orange curd that takes no more than 20 minutes to prepare and can be used as a filling for cakes, pies, and desserts is a must-have recipe on hand. Orange curd with fresh oranges is a must have. I mean must have. The sweet oranges in a custard-like filling are out of this world. Personally, I love to add some lemon in there to give it a little zing from my lemon curd. By now you must have tried my lemon curd or at least seen my lemon curd video. It’s simple, easy and really luxurious. It’s a no-fail method because I made it low and slow. As a result, you will never have a curdled curd whether you make lemon or orange curd. Did you know the options to make fruit curd using this exact same method are endless? I love using citrus fruits because I really enjoy the tart flavors. 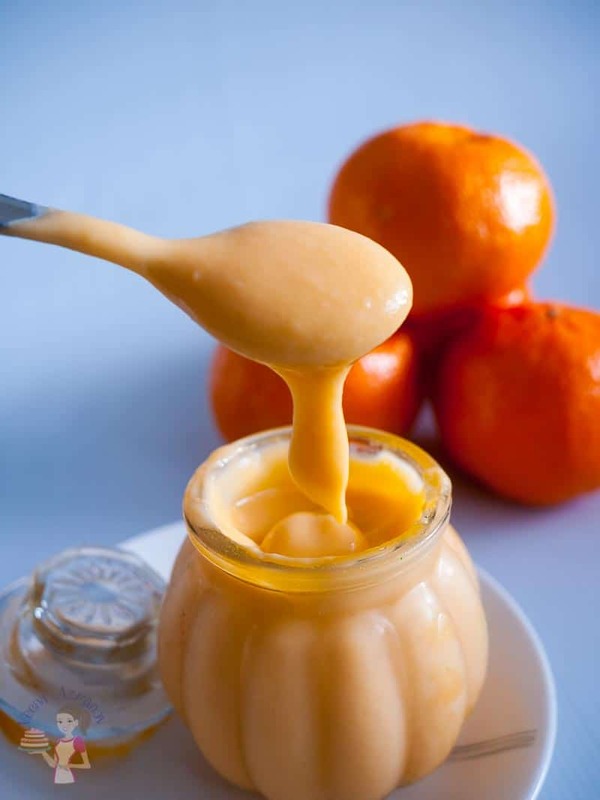 If you love fruit curd you must substitute the orange juice in this recipe with any other fruit juice, such as tangerine, passion-fruit, limes, or grapefruits. I’ve even made mango and pineapple. Pineapple curd is absolute heaven. The common equipment used to make curds or melt chocolate is calleddouble boiler or Baine Maire – Which basically means two pots – that sit comfortably within each other as below. You can do this at home – just find a sauce panand a mixing bowl that sit comfortably so the bottom is just tad bigger than the top. Oranges – Use the measure of orange juice not the number of oranges when making this recipe. So if a recipe says 1/2 cup juice (3 to 4 oranges) usually the number is a guide – the actual measure you want to use is 1/2 cup or 60 ml. This can make a big difference. Lemon – A little tart taste in contrast to the sweet seasonal oranges works a treat. Unless of course, you have sour oranges than lemons won’t do justice. Instead, I suggest you add all orange juice. Caster Sugar – Caster sugar is usually a fine grain sugar. Use a fine grain sugar that will dissolve easily in the eggs. If you don’t find caster sugar just pulse the regular sugar in a food processor and that will help give you a smooth finish. The amount of sugar used here presumes you have beautiful sweet seasonal oranges. If, however, the oranges are not sweet I highly recommend you add a few tbsp more of sugar. And yet, NO more than 1/4 cup or 30 grams though. Egg yolks – The color of yolks will determine the end color of your orange curd. So if you use light yolks you will have pale yellow color curd. A bright golden yellow or orange is much preferred. I’m using free range eggs that have a nice orange color today. Artificial colors – I never use any artificial coloring in my lemon curd, but often I use orange curd in my cakes as filling. So sometimes I do add a dab of orange color just so it will be obvious on the cake. Orange color layers look nicer between two vanilla or chocolate layers. Can I make this a Sugar-Free Orange Curd? Orange curd is done exactly the same way as lemon curd. Since it is a very popular recipe on my blog I have made a video for it. You should be able to see the video on this post as well. If not, just go to my recipe no-fail lemon curd recipe. You can use exactly the same method shown in that video with the list of ingredients found in this post. This no fail lemon curd recipe will give you the confidence you need to make fruit curd like never before. My step by step pictures, tips and trouble shooting will help you master the perfect lemon curd in just one attempt. This sweet, thick, tangy, creamy and velvet like lemon curd is luscious and luxurious with any desserts or everyday treat from cake fillings to breakfast toast. Place oranges and lemon in the microwave for 10 seconds before you cut and squeeze this will make it easy. Warm the orange juice for about 30 secs. Add egg and yolks, sugar, salt, cornstarch, and zests. Whisk until light and fluffy – sugar should almost melt. Add orange juice and lemon juice slowly into the egg mixture. Now place the bowl on the double boiler/hot water pot. About 8 to 10 minutes – you will notice the foam that was caused by whipping the egg mixture will slowly disappear and the mixture will start to thicken. Continue to stir until it coats the back of your wooden spoon or spatula. The curd is best stored in a mason or glass jar in the fridge. The presence of eggs in lemon or orange curd makes it a perishable filling. So any item that has homemade lemon or orange curds such as cakes and pie needs to be placed in the fridge. Avoid keeping fruit curd or citrus fillings in metal containers as it can react with the metal. About 8 to 10 minutes - you will notice the foam that was caused by whipping the egg mixture will slowly disappear and the mixture will start to thicken. The curd is best stored in a mason or glass jar in the fridge. 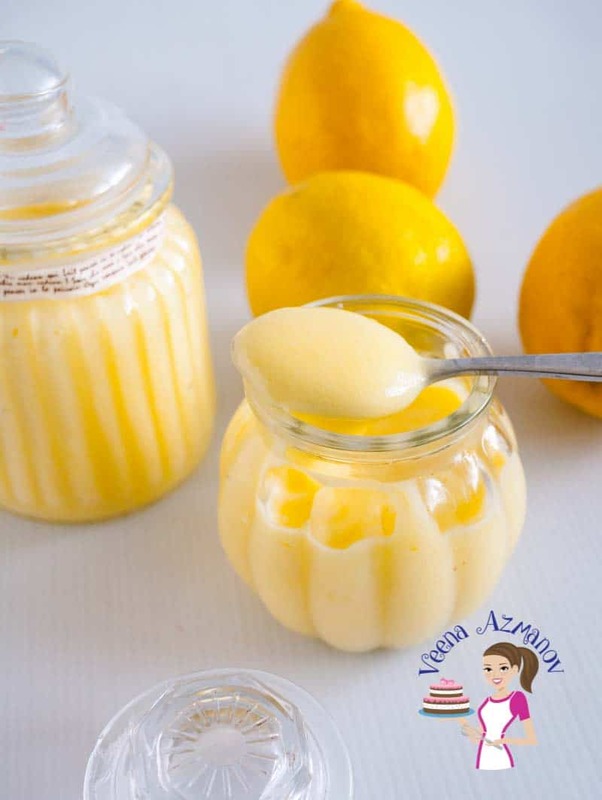 The presence of eggs in lemon or orange curd makes it a perishable filling so any item that has homemade lemon or orange curds such as cakes and pie need to be placed in the fridge. Well, there are lots to choose from right here on my blog. 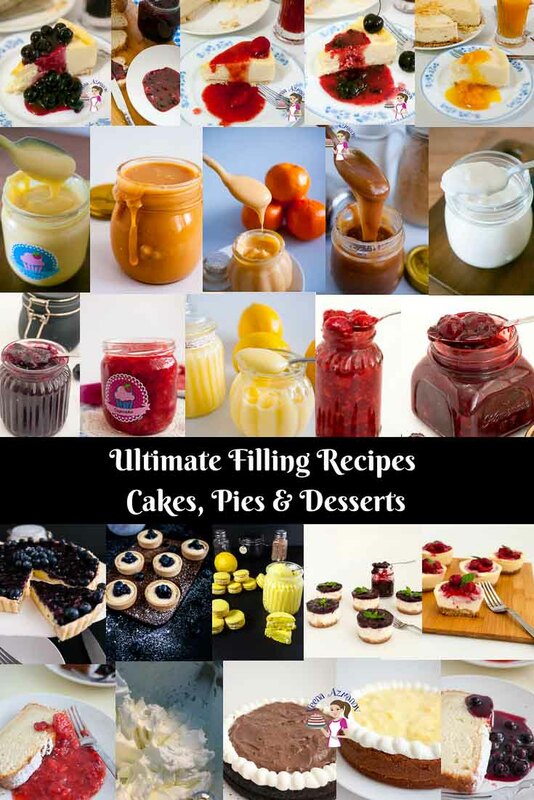 Below you can see some filling recipes that are on this blog or to be added soon. So whether you are looking for a simple quick fruit filling of strawberries and cherries or an indulgent fruit curd such as lemon or orange. Try a creamy caramel filling or an eggless pastry cream filling for those light and low carb days. 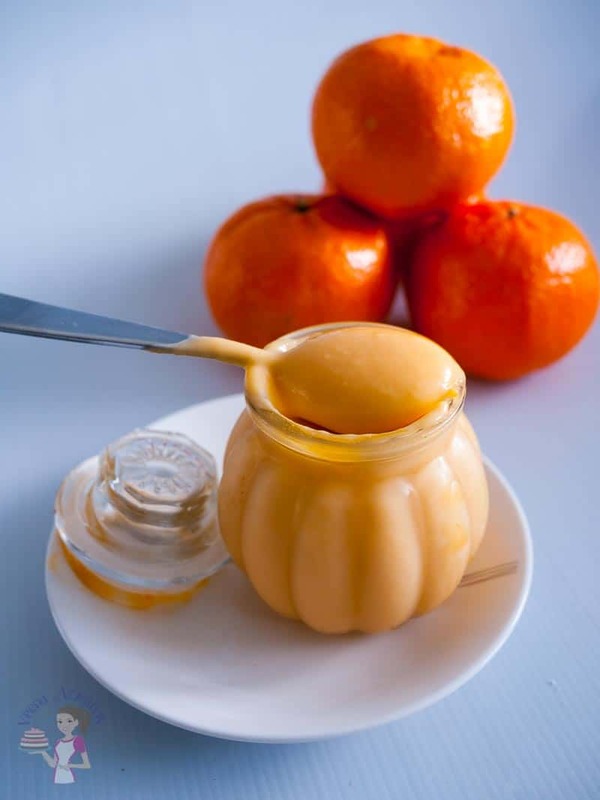 Can this orange curd be made without sugar? And also, can I use any artificial sweeteners as erythritol? Yup. Made this with oranges and lemons right off the tree. I added a little Cointreau to add to the shelf life by a bit. I am about to make some vanilla bean ice cream with orange curd, and a swirl of caramel… Oh dear! Thank you, Cayce. So happy you enjoyed this recipe. Contreau sounds like the perfect addition. Orange curd ice is one of my favorites. Hi, just making this now and looks great! Will be using it as part of the filling in a chocolate Jaffa cake cake! Just wondering if you have any idea how long this keeps for in the fridge? Hey Katrina. This can stay in the fridge for a week at least. I usually end up eating leftovers with a spoon myself (wink) after I fill in the cakes. Great looking recipe! I’m just starting it and the instructions say to add salt but there isn’t an amount listed in the ingredients. The lemon curd lists 1/2 tsp – is it the same for this? I just.made the orange curd. It’s really good. I want to ise it in a merengue roulade. Thanks for sharing the recipe. Thank you, Isaura. So happy you enjoyed it – Orange curd in a meringue roulade sounds delicious. Okay, I’ve heard of lemon curd but not orange curd! I’m going to have to give this a thought. Great, thanks so much! My husband has just tried it and couldn’t believe how delish it was! You’ve been a great help as I was originally looking to buy in the shop but couldn’t find any so your recipe inspired me to try making it and the result is a mega success! Thank you Katrina. So happy to hear you enjoyed it. I love it myself very much. Enjoy your cake. I’m not much of a dessert maker , but this sounds amazing! Like other people, I have made lemon curd for years, but never orange. And now I can’t imagine why. I can see so many places I could use it! Thanks for the recipe! Oh, then you must try orange curd. It’s so delicious. I have never tried this before. Looks so delicious. Saving it for later. Thank you, Mallya. Let me know what you think, if you try it. 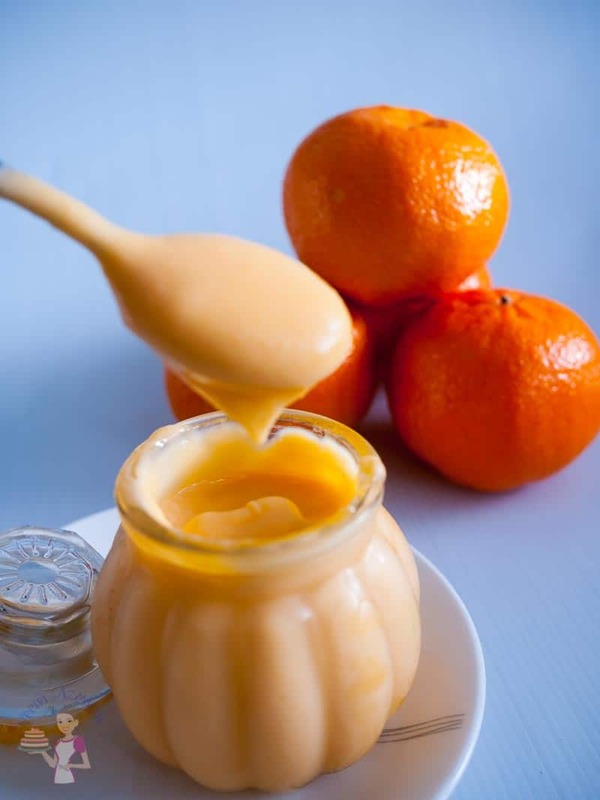 Orange curd is perfect for summer dessert filling! I love how easy this is to make too. Absolutely, Sharon. Very refreshing and perfect for summer. I love that you are using whole eggs and egg yolks for this recipe! The curd looks absolutely perfect and I cannot wait to try it out! I could have it with my greek yoghurt in the morning! 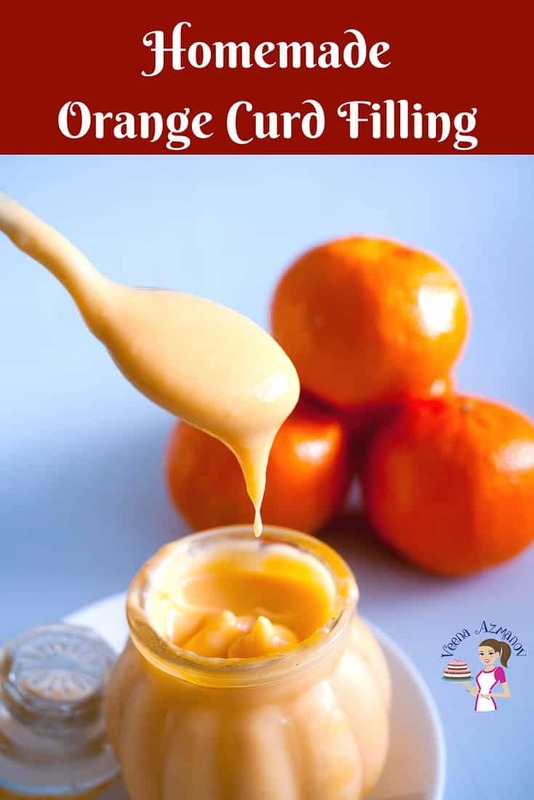 This orange curd looks so smooth and has a beautiful color. Homemade curds are really easy to make and we prefer them to store bought. This one sounds great and I love all fresh ingredients! We’ll have to give it a try the next time we need an orange flavored filling or topping. Thank you Kim. Yes,this is definitely one to make if you love curd. Thank you Karly!! They will love this. 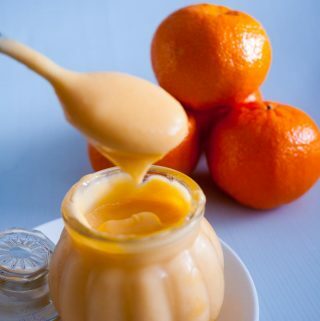 Wow this looks so delicious, I never tried orange curd,feel like licking it right now! Thanks, Prasanna. I hope you give it a try. Absolutely, Dominique. I use it in cakes, macarons and over ice cream more often than I planned. Could you please tell me what “nos” means? Thank you for your t time! Ah Sylvia – Thank you so much for bringing this up. Just corrected. When I make a draft of my recipes while I’m working in the kitchen, I write shortcuts like nos for numbers. That way I journal my recipes. Stupid me sometimes I copy and paste the recipe for the blog but then forget to correct the shortcuts. I’m so use to them I tend to look right thru them when I’m proofreading. Really like this recipe! I’ve made some blood orange curd earlier this year, and it was soooo good! This stuff goes so nicely with cakes!!! Absolutely Anna. Works a treat as a cake filling. I love lemon desserts and making lemon curd too! I have never made an orange curd but I would love to be dipping some vanilla wafers in this right now. Thanks for sharing! Thanks, Analida. You will love orange curd. It’s a sweeter version of lemon curd.